Our deepest congratulations to you and your fiancé on your happy engagement! The planning process of what is to come should be fun and memorable, which is why you need Wedding Planner Professional to make the planning easier and effortless. Designed especially for everything to do with wedding planning. Helps keep track of tasks, guest list, vendors, budget/costs, ideas, notes, seating arrangements and the wedding day itinerary. Everything you need, in one place! - Currency support - Perfect for destination weddings! Sync and store your data on cloud services such as iCloud or Dropbox. Alternatively, sync using 365 Direct Sync over your local network. Draft, edit and make infinite changes to your wedding day schedule. Automatically sorts your changes by the time, so everything goes smoothly. 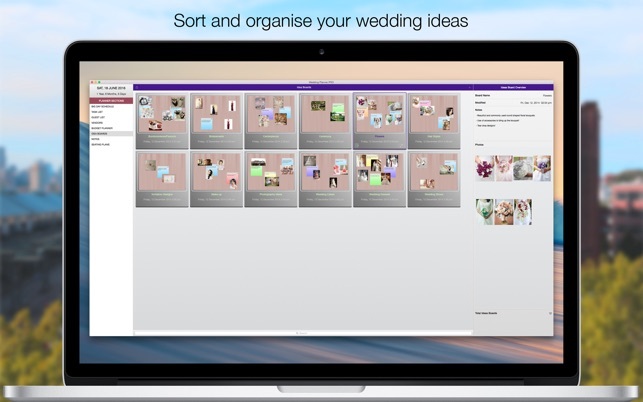 Preset with wedding task suggestions to kick start your planning and keep you organised. Effortlessly track RSVPs and mark +1 - gender selectable - for any guest. Tracks special dietary, gifts received, sent invitations, attendance and more. Save unlimited vendor images to help decide which vendor best suits your wedding needs! 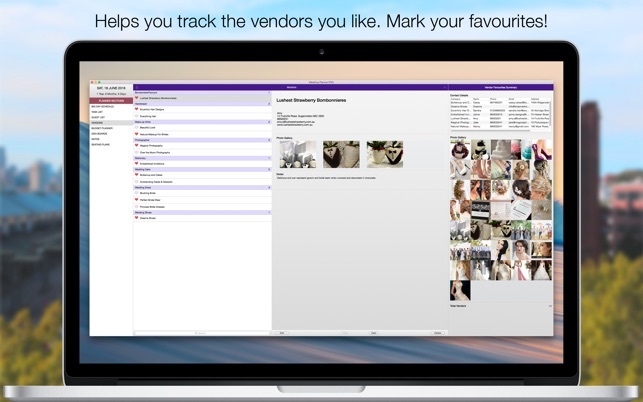 Tracks vendors’ contact details, such as address, phone, email, website. Preset with wedding budget suggestions. Automatically calculates your total estimated budget, actual cost, total paid and balance. Tracks partial payments to help you stay in control with payments/costs. Effortlessly add tables and objects to the workspace. 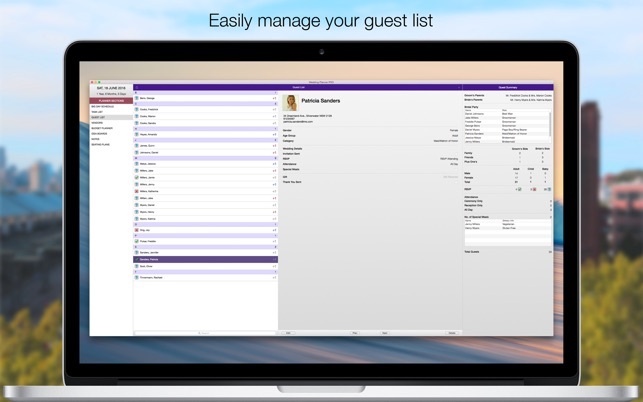 Easily manage, shuffle or assign guests to tables. 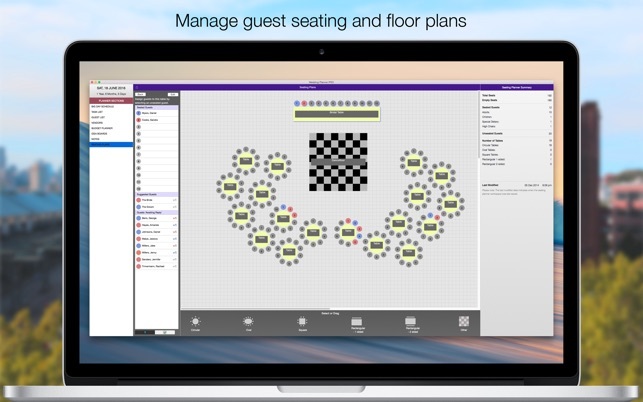 Handle any seated guests that are no longer attending. Creative space for images and notes to help visualise, sort out and brainstorm ideas that you would like for your big day. 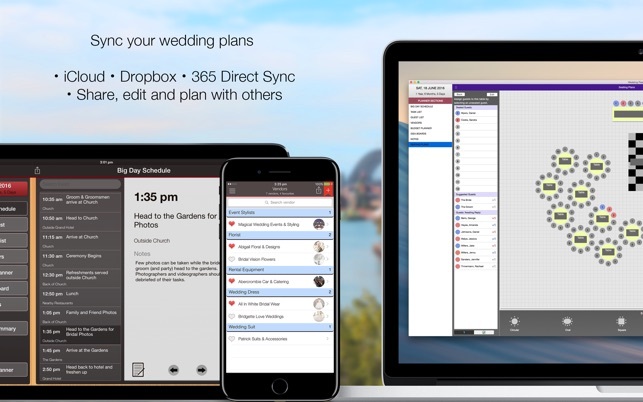 Keeps tracks of your progress throughout your wedding plans. Supports all weddings, i.e. bride/groom, bride/bride, groom/groom - it should be about LOVE! Manage multiple weddings with any currency at any one time. Perfect for professional wedding planners. Wedding Planner Professional is also available on iOS for iPhone/iPad. We'd love to hear from you. Please write to us for any bugs/issues so we can fix them right away. *Multiple Wedding Planning feature is subscription based. The duration of this subscription is for 1 year (US$119.99). Payment will be charged to iTunes Account at confirmation of purchase. Subscription automatically renews unless auto-renew is turned off at least 24-hours before the end of the current period. Account will be charged for renewal within 24-hours prior to the end of the current period, and identify the cost of the renewal. Subscriptions may be managed by the user and auto-renewal may be turned off by going to the user's Account Settings after purchase. No cancellation of the current subscription is allowed during active subscription period. Program is not build to work, most of functions ( icloud sharing, guest list and some others are not working properly. It seems that I waste my money. very expensive. buggy. no help files.CONSTANT crashes. Really wasted my money.